The iSquare protocol is the data-gathering technique developed by the research team at the Faculty of Information, University of Toronto; it has been used to generate the existing Corpus of iSquares. It is informed by the methodological literature on the draw-and-write technique and specifically an awareness of the ideal constraints to apply during data-gathering. With this protocol, researchers and educators can take advantage of a proven strategy for arts-informed, visual research into the concept of information (or, the protocol can be adapted to explore other concepts). Importantly, the use of the protocol establishes social scientific reliability, that is, consistency across different implementations of the research design. Widespread use of the protocol will enable a more rapid accumulation of insights about the visual dimension of information and support collaboration. The main elements of the protocol, listed below, pertain to ethics; setting and timing; instructional script; paper; iSquare size; front and back sides; drawing instrument; and (optional) incentives. The protocol concerns data collection only and leaves researchers free to analyze the iSquares as they wish. As research involving human subjects, the iSquare protocol requires permission from an Institutional Review Board under the direction of an Office of Research Ethics. In the iSquare protocol care is taken with consent (verbal), right to withdraw, and confidentiality through the construction of data with no personal identifiers. The first study at the University of Toronto was geared to low-risk population and was a delegated (not full IRB) review process. For assistance with an ethics application, contact Dr. Jenna Hartel via the online form. The iSquare protocol entails a carefully controlled, 10-minute data-gathering outing in which research participants are collectively given oral instructions by the researcher(s) and then the activity is supervised until completion. This creates a stable environment that induces reflection and creativity. It is imperative that all participants have a chair and desk (or table) to use and distractions should be eliminated if possible. Ideally, the data-gathering occurs when the attention of research subjects is freshest. Another important feature is that the activity is not described to participants in advance, so that responses are uniformly spontaneous. The entire data-collecting session takes 10-minutes, that includes a 2-minute introduction, 7 minutes to do the exercise, and 1 minute to "wrap up" (collect pens and iSquares). To obtain permission to work with a group, we recommend an email solicitation, as shown at right (this recruitment message assumes the target population is a class of students and the email is sent to the instructor). We are writing to learn if you would allow innovative, arts-informed, visual research to be conducted in your class this semester. As a part of an ongoing study about the nature of "information" we are asking [people/students] to draw their conception of information on a 4” by 4” piece of paper, coined an iSquare. Our research objective is to better understand visualizations of information and we are hopeful you will help us to understand the perspective from [their community]. A team of 2-3 researchers will supervise the 15-minute activity and provide the necessary materials. We have already collected many iSquares and can attest that most people find the drawing exercise to be fun and thought-provoking. As thanks, we will supply a healthy snack to every person that submits a drawing [optional]. The session can occur at any time during your class, with our preference being for the start of a session. Since we are eager to get underway, may we suggest a visit on [x]? We will also follow up with you by email in the next week. "Good morning/afternoon/evening everyone! To start, we’d like to thank [x] for agreeing to let us be here today. We are [researchers introduce themselves]. During the next 10 minutes we will gather data for a research project. We are trying to better understand the nature of information through a simple drawing exercise involving a 4.25” by 4.25” inch piece of paper and a black pen. Essentially, we want you to answer the question “What is information?” in the form of a drawing; and also complete the sentence “Information is…” on the back side of the same piece of paper. Our intent is to analyze the drawings and sentences to determine common understandings of information. To begin, we need your consent and participation. Please note that the exercise is unrelated to your class; it is not an assignment and is not mandatory. If you do not wish to participate, you may instead fill this time as you choose, but please do not disturb other participants. Also, no personally identifiable information will be collected that links you to the study. Put another way, you will remain an anonymous contributor to this research. You might find that the activity stimulates your imagination and is fun. We are distributing the paper and pens right now, and we ask that you use our materials only, please. In other words, please don't use any other pens or paper. First, on the blank side of the square respond to the question, "What is information?" in the form of a drawing. Then, on the reverse side, complete the statement “Information is...” Please also answer the demographic questions that are on the back of the square. You will have 7 minutes to complete the activity, until [state time]. Are there any questions?" Researchers will need an abundant supply of blank iSquares. White art paper or card stock are the best materials. The substantial and luxurious surface sets a more inviting and serious tone for the activity. Drawing paper does a better job than card stock of absorbing black ink quickly (to avoid smudges) but either work well. The paper should be heavy enough that markings do not bleed to the other side, yet it can still pass through a laser printer or photocopier. The stiffness that accompanies a heavy weight also contributes to easy sorting and handling. 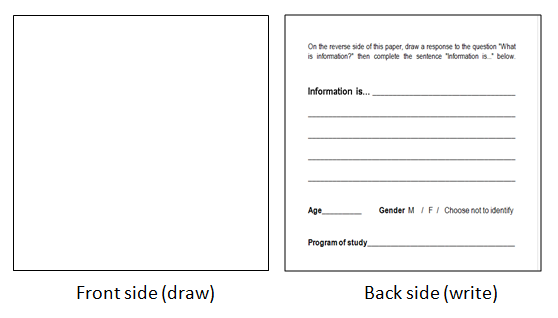 To produce blank iSquares for either research or pedagogy, the iSquare template is printed or photocopied onto drawing paper or card stock; then each sheet is sliced along the two light grey lines with a paper cutter. The drawing surface is sized for the most economical use of 8.5" by 11" paper, which generates four iSquares and one piece of scrap. Why are the iSquares 4.25" by 4.25"? As just mentioned above, these dimensions enable the most economical use of a single sheet of paper to form four blank iSquares. Also, the relatively small surface area suits a 10-minute drawing activity; a larger piece of paper would require more time from research participants, which can be difficult to obtain. What is more, the resulting data set is portable and easy to manipulate; it resembles a deck of cards. One can spread up to 150 iSquares across a table to discuss with a class or analyze with a research team; it would be impossible to gaze across an equal number of pictures of larger dimensions. The same economies carry over to data-management tasks such as scanning, which would be more labor intensive for larger drawings. One scholar asked, "Why not iCircles instead?" This is an interesting idea conceptually and aesthetically but is not easy to implement; it is time consuming to cut out circles! The draw-and-write technique entails a drawing activity along with a writing exercise. For the drawing activity, research subjects are asked to respond to the question "What is information?" in the form of a drawing on the front side of the paper. Then, they are asked to complete the sentence, "Information is..." (using words) on the back side of the paper. One of the long-term objectives of this project is to explore the relationship between visual and textual conceptions of information. The back side also contains prompts for the participants age, gender, and program of study (a field which can be changed to suit different research objectives and populations). To maintain confidentiality in the data, no personally identifying information is collected about participants. The writing instrument contributes to the outcome of a drawing exercise and should be controlled by the researcher. In this protocol, a black roller ball or gel ink pen is provided to research subjects, such as the one pictured at left. It is not recommended to allow the use of a pen (or pencil) that belongs to the research participant, which would introduce greater variability into the drawings. While it is an interesting question whether color may play a role in visual conceptions of information, it is expensive and complicated to supply participants with a set of colored writing instruments. Generic versions of black roller ball pens can be purchased in packets of 10 at a dollar store, for $2.00. Expect to lose a few pens each time the data-gathering activity is performed. Compared to drawings made with pencil, charcoal, chalk, pastel or crayons, those created with a steel pen are especially firm and precise due to a steady ink flow. The iSquare protocol can be implemented with or without a modest incentive for research participants (e. g. a granola bar). To date, we have collected iSquares both ways and participation rates and experience seemed to be the same.